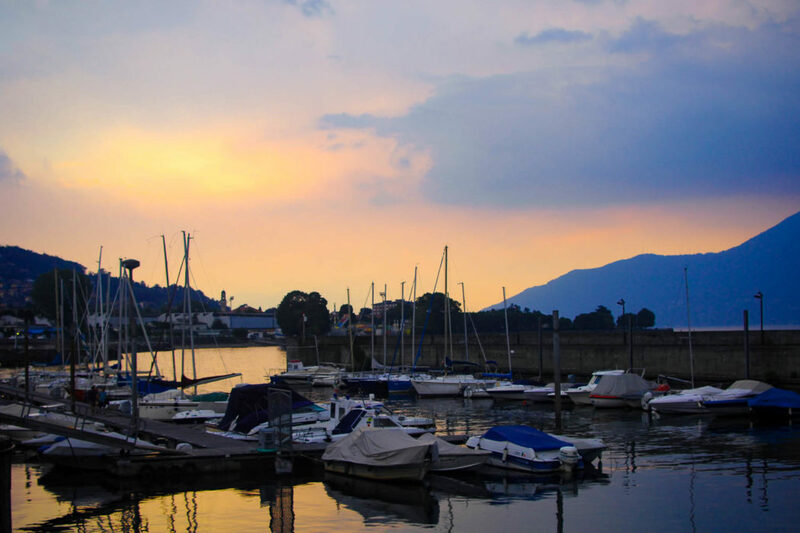 During the first week of the summer holidays we travelled as a family to Lake Maggiore in northern Italy, using a beautiful villa as a base for our Italian adventure amidst vast lakes, imposing mountains and spectacular views. This post is the third and final part of our travel diary, covering the last few days of our Italian adventure to this beautiful area of the country that I first fell in love with fourteen years ago. You can read all about what we got up to during the first half of our holiday in Part One and Part Two. One thing I loved about Lake Maggiore was how lush and green the surrounding landscape was. It was a refreshing change from the scorched lands we’d left behind us thanks to the glorious summer heatwave England had been experiencing since May. Back home we regularly go for long walks in the woods, exploring the undergrowth, gazing upwards in admiration at the height of the trees stretching to the sky above us, and enjoying the cool of the shade where only dappled sunlight manages to filter through. I’d been doing some research into what other little excursions we could do whilst in Italy that were perhaps a little different from where many visitors might choose to venture to. Whilst reading my trusty Lonely Planet guidebook I came across a place called Orrido Sant’Anna, deep in the foothills of the mountains behind Cannobio and, upon reading the description, knew immediately that I wanted to go there. It looked and sounded beautiful, and an ideal Italian adventure for us as a family: a stroll inland up the Cannobino River through pretty woodland to a clearing with shallow waters perfect for paddling; a pretty 17th century church perched atop towering cliffs; and a stone bridge spanning a narrow yet thundering gorge. Everyone agreed that it sounded like a great idea and so we caught the lunchtime ferry over to Cannobio, enjoying the breeze and the spectacular views as we sped across the water. 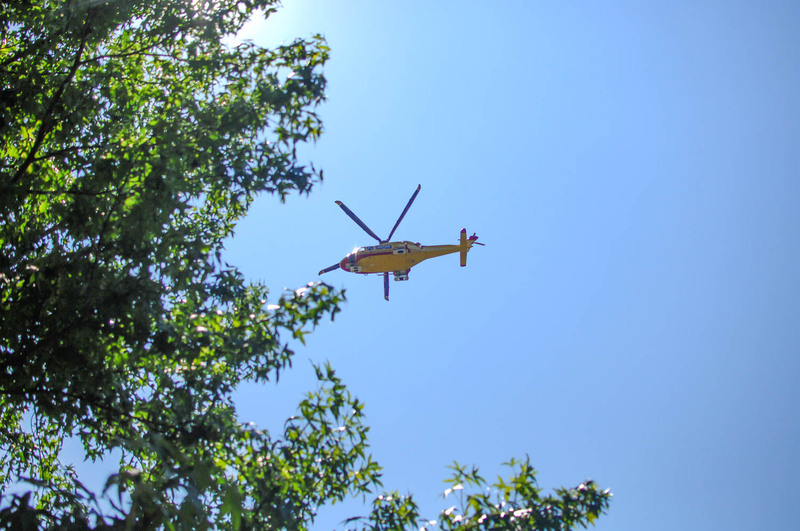 As we ambled through the cobbled streets to where the trail began, just behind the beach at the northern end of town, pausing briefly to watch the air ambulance land and take off again, it became apparent that there had been some miscommunication – the girls were under the impression that we’d be playing at the beach first and then going for the walk. It was a scorchingly hot day – the hottest day of our trip so far – but we set out anyway (amidst numerous grumbles) and managed to reach the pedestrian suspension bridge that marked the start of the walk. It took a while as there were a few sit-down protests along the way, but it was worth it. The bridge spanned the width of the river and the girls delighted in it’s bounciness as they marched across it, marvelling at the views both up and down stream. I spotted a lone church right at the top of the mountain and silently wondered how many visitors it actually received. Lola thought the bridge was ace! The view downstream. Can you see the solitary church right at the top of the mountain? Upon reaching the other side of the suspension bridge we realised that we’d already run out of water (despite taking four bottles with us!) and, knowing that we had at least a 45 minute walk ahead of us to reach Orrido Sant’Anna (and the same to come back again), we reluctantly admitted defeat and decided to abandon our plans. I have to admit I did feel quite disappointed as I’d really been looking forward to a long walk and something different to see during our Italian adventure, but sometimes you just have to compromise and let the majority vote win. Again, that lesson of needing to be flexible and adaptable when travelling reappearing just when I needed it to. As we retraced our steps across the bridge I noticed something I’d somehow managed to miss on the outward crossing – hundreds of padlocks secured to the wires of the bridge, stretching out along it’s length. I was thrilled – I’ve heard of the bridge in Paris full of ‘lover’s locks’ and have always wanted to see it, so finding one here in Italy was a completely unexpected and very welcome surprise. We spent ages looking at them and reading the messages that people had engraved on them. Some of them were dated back years – the earliest one I found was from the seventies. There was even one proclaiming an endless love for Justin Bieber on there! We meandered back into Cannobio and sat in the shade to eat an obligatory gelato (also purchasing some more water whilst we were there) and I went for a little solo wander through some of the back streets of the town behind the main waterfront promenade. The tiny medieval streets were fascinating: wooden window shutters; ornate doors; lines of washing stretching above my head; little Italian nonnas sitting in chairs with their hands folded neatly in their laps, watching the world go by; children playing together in hidden courtyards; and window-boxes overflowing with a cornucopia of colourful flowers. Further down at the southern end of town (before we embarked the ferry back to Luino), hidden behind the lakefront bars and restaurants, I discovered a maze of little boutiques; bakeries; pasticcerias; more gelaterias; plus numerous traditional trattorias, listing all manner of delicious sounding dishes. It felt like being transported back in time and you could almost imagine what life must have been like here hundreds of years ago. After catching the ferry back to Luino we retired to the villa for a couple of hours to cool down, shower, change out of our sticky, sweaty clothes and relax a bit before we headed out again in the evening for dinner. We’re nothing if not creatures of habit and everyone voted to go back to the same restaurant we went to a few nights ago: Pizzeria La Vecchia Pesa. Well, with pizzas that amazing (and knowing that we’d have enough left over for another meal at the villa the next day) it would be rude not to really. I opted for the ‘vegetariana’ again as it was so delicious last time, whereas the husband chose to be brave and tried the ‘diavolo’. Let’s just say it was pretty spicy! We remembered our error from our previous visit and this time just ordered a ‘margherita’ for the girls which they devoured quickly and washed down with the free glass of juice they were given as we arrived. The same waiter was there as before and he remembered us and chatted with us about our Italian adventure whilst we ordered our desserts. The customer service really was excellent and we thoroughly enjoyed our meal. I can highly recommend it if you ever find yourself in Luino. Wandering into town for dinner. This was such a beautiful walk to do – the scenery was just breathtaking. We liked this restaurant so much that we went there twice! After dinner we had a wander through the town along the promenade again, just as the sun was beginning to set and I couldn’t resist capturing a few photos of my little tribe. The light was just beautiful and the colours were so pretty – they’ve ended up being some of my favourite photos from our whole holiday. As we walked slowly back towards the car we noticed dark clouds rolling in over the mountains on the other side of the lake and the temperature started to dip quite suddenly. We could feel a storm coming from the change in the air and it was clearly advancing fairly quickly – within minutes we could see the rain falling on the far shore. We hurried back up the mountain in the car (well, as quickly as we could considering the hairpin turns!) and got back to the villa just as the heavens opened. I love storms and watching it spread across the lake until you couldn’t see the mountains, the lake or the trees any more really was quite something to behold – a wall of dramatic clouds advancing like an army. The thunder rolled relentlessly and the lightning split the sky in two as the rain hammered down on the deck outside whilst we stood in the shelter of the lounge, silently watching the majesty of it all. The girls didn’t go to bed until gone 10pm, at first watching the storm with us and then being unable to sleep thanks to the howling wind. It was certainly an experience they won’t forget in a hurry – and neither will I! It really was an epic storm and I’m so glad I got to see it. The colours were so beautiful. This was my favourite evening from our Italian adventure. The final day of our Italian adventure dawned clear and bright, as if the storm the night before had never happened. The morning was spent pottering: gathering up our belongings which had inevitably been scattered around the villa despite my best efforts to try and keep everything relatively contained; starting to pack a few bits and pieces into suitcases so we didn’t have to do it all that evening; and taking the opportunity to relax on the balcony in the sunshine with a book. We also popped into Luino for one last little walk along the promenade and so the girls could buy some small souvenirs with what remained of their holiday money. After lunch we gave the girls the reins and let them choose how they wanted to spend our last afternoon in this beautiful part of the world. They decided that they couldn’t possibly go home without eating one last gelato and having one final swim in the lake and so that’s exactly what we did. We headed down to Maccagno mid-afternoon and enjoyed every single bite of gelato, sat in the shade outside a café and watching the world go by. It’s a pretty little town and I wish we’d taken the time to explore it better – I have a feeling there’s more to it than meets the eye beyond the appeal of the lakeside beach. Tummies satisfied, we wandered slowly down towards the lakeside, chatting about what our favourite parts of our Italian adventure had been. I wanted to try and absorb as much of the scenery as I could, storing away every detail in my head and my heart so that I could remember our time there in the years to come as clearly as if I were actually still there. The charmingly cobbled streets; the flaking, painted window shutters; the magnificently ornate doors; the impressive archways; the lush greenery; the colourful flowers; the delicious smells that emanated from every home and restaurant that we passed; the unique blue of the sky; the intake of breath as you step into the open and are dazzled with the sparkles on the water of the lake flanked by the incredible mountains beyond. Italy really does tantalise every single one of your senses. We spent a happy couple of hours playing in the water – I wish I could bottle the girls squeals of joy – before lying in the sun to dry off, letting our bodies soak up as much Vitamin D as possible, relishing the warmth on our skin, the smell of the sun cream, the light breeze tickling us and simply enjoying being together. I don’t think any of us wanted to leave. One final family selfie, an ‘interesting’ dinner that consisted of all the random bits and pieces left in the fridge, plus a spectacular sunset later and we were finally packed, ready for a good night’s sleep ahead of our long day of travel the next morning. And one final incredible sunset to end our holiday. Originally we weren’t due to fly home until the early evening but our flights got changed to the morning instead and so we were up early and out of the door of the villa by 8am, sadly waving goodbye to our home for the past week of our Italian adventure as we carefully wound our way back down the mountainside. It really was the perfect accommodation for us – plenty of space, spotlessly clean, and with views across Lake Maggiore that will stay with me forever. Sadly we left the sunshine in Italy and came home to a downpour. There wasn’t much talking during our two and a half hour drive back home from London – I think we were all completely absorbed in our own memories of our trip. It did, of course, have it’s challenges, as any holiday or travel experience (with or without children)inevitably does but I can honestly say that we all loved our Italian adventure at Lake Maggiore. We’ll be back again someday, I’m sure of it. Below is a vlog of our whole trip. They take me ages to put together but we all absolutely love watching them back, remembering what we got up to, how much fun we had and all the new things we experienced. Thanks Ella. We did have a brilliant time – it’s such a gorgeous place. Really?! How did I not know this? Will definitely have to go and find them next time I’m down there. Thanks Nell! The Italian lakes look wonderful and it looks like you all had the best time. I loved following your pictures of this trip on social media and yo’ve got some amazing shots here too. The storm in your video is impressive – I love a good summer storm! Thanks Daisy. The storm was incredible to watch and the next day you would never even know that it had happened. Thank you Gail. So many people have told me about lover’s lock bridges since I published this post – apparently there’s one in Liverpool too! Sounds and looks so beautiful. We are off to Italy in the spring and I can’t wait. The kids are going to love it. Cant beat italian ice cream too. It was such a stunning place Jenny. How exciting that you are off to Italy too – whereabouts are you going? That’s exactly it Sarah – it’s the stories behind the padlocks that fascinated me. I know we haven’t met in person yet but I know we’d be firm friends – I think we’re very similar in the things that are important to us. Chloe I absolutely loved following your trip!! Your photos are always so so beautiful. 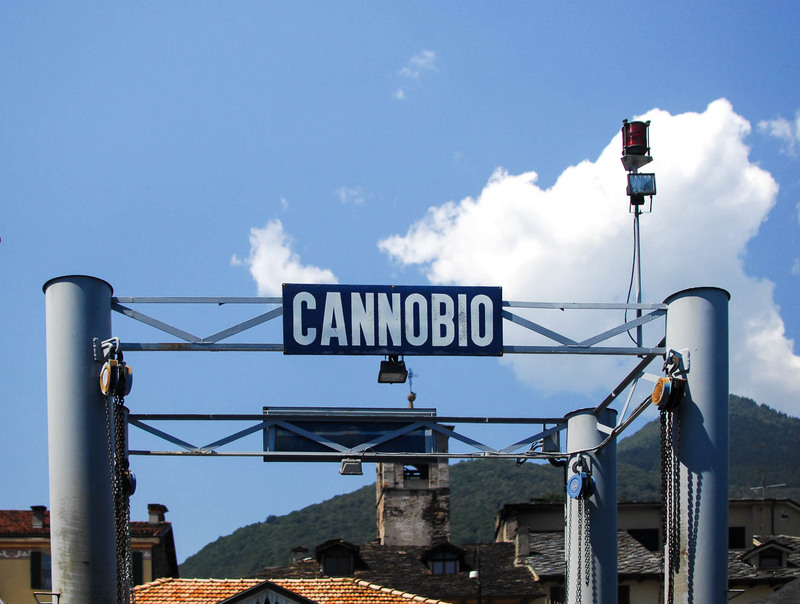 Cannobio was a favourite of ours and I totally would’ve spent hours looking at the lovers locks on the suspension bridge too. Maccagno is pretty special too isn’t it? thanks for linking up to Monday Escapes. Thanks Katy. It’s certainly a very special part of the world. I definitely want to explore more of Italy now!